March 7-9, 2003, the Women's Day March For Peace brings a close to the winter-long peace vigil by "Code Pink, a Woman's Vigil and Fast for Peace," which arrived in Lafayette Park on November 17, 2003. Members of the Peace Park Antinuclear Vigil were delighted to welcome these effective, focused folk, even though the Park Police began making some harsh rulings in wintry weather. See "Peace protests near White House growing," and "Where the Cold War Continues," and "Protesters say new group spurs crackdown." March 15th is the "Emergency Antiwar Convergence on the White House."
. de-alert nuclear weapons immediately. 10,000 Drums V September 2, 2002 (Monday, Labor Day), north of the White House in Peace (Lafayette) Park. 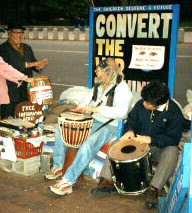 * Saturday, October 13, 2002 in solidarity with people around the world, drums were pounding outside the White House to Stop Star Wars - No Weapons In Space, as well as to pray for an end to the killing in Afghanistan. Thanks to the 60+ people who joined us on June 3, 2001, to drum, feast, speak, and celebrate the 20th anniversary of this 24-hour-a-day presence. We had a big circle; people had come from as far away as Ecuador, Korea, Florida, Michigan, Baltimore, Fredricksburg. We missed (and appreciate the many messages from) others who were unable to join us. We're always ready for a Peace Park party, so if somebody wants to help get a weekly event going (music welcome), contact us. Thanks also to those who sent vigiler Ellen Thomas as a delegate to the World Conference Against A & H Bombs in Hiroshima and Nagasaki, Japan in August, 2001. Those who stayed in D.C. participated in the 20th annual Hiroshima and Nagasaki commemoration activities the week of August 5th to 9th. And a number of Japanese activists joined us in October to drum against the war. * Congresswoman Eleanor Holmes Norton re-introduced the "Nuclear Disarmament and Economic Conversion Act" for the fifth time on July 16th as HR-2503, with a new clause calling for renewable energy. Please call her office (202-225-8050) to thank her, and to inquire how you can help promote the bill! * Some news for friends and fans of Elijah: once again, he's apparently run afoul of societial strictures. * Every Saturday and Sunday, 2:00 PM, DRUM FOR DISARMAMENT in Lafayette (Peace) Park! Bring instruments, heartsongs, dance, express yourself! Peace is possible! October 12th: 12 noon, Indigenous Peoples' Solidarity Gathering in Lafayette Park with Global Peace Ambassador. Co-sponsored by Grey Panthers and the Piscataway Tribe. From the opportunity presented from the hand delivery of a letter to President Clinton about these events, it is this day that we are arranging for our spiritual leaders to meet with him. October 17th: Swathmore College - Spiritual Environmental Summit. October 19th: Princeton University - Spiritual Environmental Summit. October 24th: Sunrise ceremony. Breakfast. Walk down to UN Headquarters on 55th Anniversary. We are holding a Spiritual Environmental Summit at The Baha'i Center Auditorium (53 East 11th Street - University Place/Broadway), 7pm-11pm. * September, 2000 - Ongoing Fast for Justice and Peace in Vieques, Puerto Rico, which includes, Every Week Day, a Vigil in Front of the White House, 6:30-8:00pm. Washington Post. * On September 22, there will be a "National Day of Solidarity with the People of Vieques" in Lafayette Park. For more information: www.viequeslibre.org and www.viequesvive.com. The 59th day of the Fast for Justice and Peace in Vieques, Puerto Rico, which included a Daily Vigil in Front of the White House, 6:30-8:00pm. Washington Post. * September 26-28, Washington Gathering to Free Mordecai Vanunu, Israel's nuclear whistleblower, and for a Nuclear-Free World. September 26, Conference, 9-5 p.m., and evening program - 7:30 p.m. at St. Aloysius Church, 900 N. Capitol St. NW (at K St.), four blocks nortwest of Union Station red line Metro stop. Speakers include Bishop Thomas Gumbleton, Elizabeth McAlister, Rabbi Phillip Bentley, and Nick & Mary Eoloff, Vanunu's adoptive parents, from Minnesota. Evening program includes music by Ken Giles, lifetime-service award ceremony for Louise Franklin-Ramireaz, and talk by Daniel Ellsberg: "Mordechai is my brother." Vegetarian dinner at 6:30. Wednesday September 27, there will be a dawn-to-dusk vigil at the Israeli Embassy, 3514 International Drive NW, as well as a lobby day at Congress. September 28, there will be a noon-hour mass rally in front of the Israeli Embassy to mark the 14th anniversary of Vanunu's kidnapping by Israeli agents in Rome after telling his story to a British newspaper. For information and childcare reservations, contact Kathy at Dorothy Day House, 202-882-9649. * August 30, 2000, 7 p.m. Memorial for friend of the vigil, Winnie Gallant. * Hiroshima week activities - Saturday, August 5, 6:30 p.m. to dark, Lincoln Memorial - Tuesday, August 8, 7:30 p.m to 10:30 p.m, Nagasaki Remembrance and dedication of Hibakusha Peace Statue at Josephine Butler Arts Center. For information, contact jsteinbach@igc.org, 703-369-7427. * July 1 to August 9, Fellowship of Reconciliation's "People's Campaign for Nonviolence," 40 days of actions embracing a multitude of issues, including nuclear disarmament and Iraq sanctions. * July 4, 2000 - "A Clown, a Hammer, a Bomb and God", a one-man play about the Plowshares Movement, in support of the Fellowship of Reconciliation's People's Campaign for Nonviolence, a 40-day series of teach-ins, protests and nonviolent civil disobedience that begins on July 1. - For information call 2Clown Central at 212-841-0105. 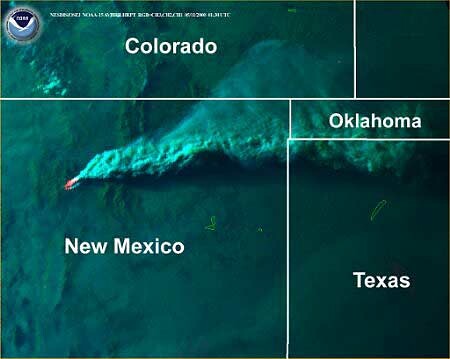 * FYI (for the young at heart): Also on July 4, 2000, "High Noon": annual Rainbow Family Gathering prayer for peace on earth (in Montana), and 4th of July Smoke-In (in Lafayette Park). * June 26, 2000, 7:00 a.m. - 24-hour Vigil on UN Day In Commemoration of Torture Victims and Survivors, by Torture Abolition and Survivors Support Coalition (TASSC). * Millenial Anniversary Drum Council! June 3 and 4, 2000, and the First Sunday of each month, 2:00 PM, Lafayette (Peace) Park - Bring instruments, heartsongs, dance, express yourself, and celebrate the 19th anniversary of the vigil! Peace is possible! * Japan cities should adopt Kobe Formula, since the national government has been lying for 40 years. -- message from Gensuikyo-Kobe's Sec.Gen. Kajimoto. * DC Days May 7-10, 2000: In each of the past eleven years, Alliance for Nuclear Accountability has hosted four days of training, education, and political advocacy that bring activists from around the country to Washington, DC, to explain the concerns of their constituencies. It is an opportunity to make your voice heard at the national level and to network with people and organizations working on similar issues. ANA Washington, DC Office - 202-833-4668, kathycrandall@earthlink.net, to sign up for next year's DC Days. It's well worth the effort! * Saturday, April 15, 2000, Lafayette (Peace) Park: Rainbow Potluck Picnic - food, drums, friends! Call Rainbow Hotline: 202-PYREMAL (202-797-3625). * March 5, 2000, April 2, and the First Sunday of each month, 1 PM - Lafayette (Peace) Park - bring instruments, heartsongs, dance (Millenial Drum Council). Express yourself! Peace is possible! Who? progressive student activists from all area universities and high schools - Important strategizing meeting for DC area students so that we can mobilize THOUSANDS of students for A16 events. Pizza and Beverages provided! Contact Melinda - Melinda@afgj.org 202-544-9355 or Smriti 202-667-9328 for questions. ** Democracy On Trial 8 am Superior Courthouse ** "Nonviolence Training Working Group meeting at 6:30 PM at 726 7th Street SE (a couple blocks from Eastern Market metro)"
** "Facilitation and Consensus Process Training, 7pm at the Greenpeace office, 1436 U ST NW, 1 block down from the U St metro stop on the green line. Starting right at 7, so please be on time. RSVP to liz_guy@hotmail.com or call 202-745-0026." * Saturday, February 19, 2000 - "Tell President Bill Clinton and Attorney General Janet Reno: ENOUGH IS ENOUGH - SEND ELIÁN HOME! Rally and march in Washington, D.C. Assemble at 11:00 am at Lamont Park (Mt. Pleasant St. at Lamont St. NW) and march to the White House. Sponsored by the National Committee for the Return of Elián to his Father in Cuba. International Action Center (202) 544-5752." ** "SEAC Mid-Atlantic (region 13) organizing meeting Feb 19th-20th, 2000 in Baltimore - All sorts of people from around our region (PA, MD, DE, NJ and DC). For a list of the people: http://www.seac.org/cgibin/region.pl?reg=13"
* FEBRUARY 16, 2000 - REPRESENTATIVES OF THE CIVIL DISOBEDIENCE CAMPS IN VIEQUES, PUERTO RICO -- 4:00PM Demonstration in front of the White House). * January 19, 2000, 7-9 pm - Bruce Gagnon, Global Network Against Weapons & Nuclear Power in Space, will speak about "Ballistic Missile Defense: The Return of Star Wars." All Soul's Unitarian Church (Pierce Hall) at 1500 Harvard St., hosted by DC Green Party and Washington Peace Center. * January 11, 2000 - 5:30 p.m., Lafayette Park - Committee for the Rescue and Development of Vieques, and anyone else who, regardless of political ideology or partisan affiliation, is opposed to the US Navy's occupation of the island of Vieques, Puerto Rico. * Y2K NUCLEAR COUNTDOWN - White House. Here's a great photo-essay by Carol Moore. See Y2K World Atomic Safety Holiday, Nuclear Information Resource SErvice, and De-Alert Campaign. * Friday, December 10, 1999, 7:30 p.m. Catholic Workers brought weekly meeting to Lafayette Park to hear vigilers' witness. Concepcion, Thomas, and Ellen spoke about what brought them to the White House, and what keeps them there. * Thursday, November 18, 1999, 7 p.m., Bruce Gagnon's Speech about Nukes in Space, at Washington Peace Center, 1801 Columbia Rd. NW (234-2000); call for participation in April 14-17, 2000, "Star Wars Revisited: An International conference on Preventing an Arms Race in Space"
* Friday, November 19, 1999, "6:00PM, in front of the White House, with drums, banners, picket signs, bull horns, etc., and demand from President Clinton once again, loud and clear, that he must order the US Navy out of Vieques now and must not allow one more bomb to be dropped or one more bullet to be fired in Vieques. Contact: Flavio Cumpiano, Committee for the Rescue and Development of Vieques, Washington, DC (202-721-4688). For more information on Vieques and updated information on events and news, please visit http://www.viequeslibre.org." * Shut Down the School of Americas! Buses driving from DC to Fort Benning Friday-Monday, November 19-22. * August 5, 1999 Hiroshima - Lincoln Memorial, 5-9 p.m.
* August 8, 1999 Nagasaki - Lafayette Park Prayer Circle, 10:00 p.m.
* July 16, 1999 - Congresswoman Eleanor Holmes Norton Re-Introduced the Nuclear Disarmament and Economic Conversion Act -- HR-2545 in 1999. * Press Conference with Rep. Lynn Woolsey (Co-Sponsor), Dr. Marcus Raskin (IPS), Mary Olson (NIRS), Bob Tiller (PSR), John Steinbach, Veterans for Peace, Bruce Hall, Peace Action (written, was ill), on July 30, 1999. ALSO, August 4, 1999, Admiral Eugene Carroll (Center for Defense Information) speech re radiation survivors gives generic support for nuclear abolition, and providing for human needs. 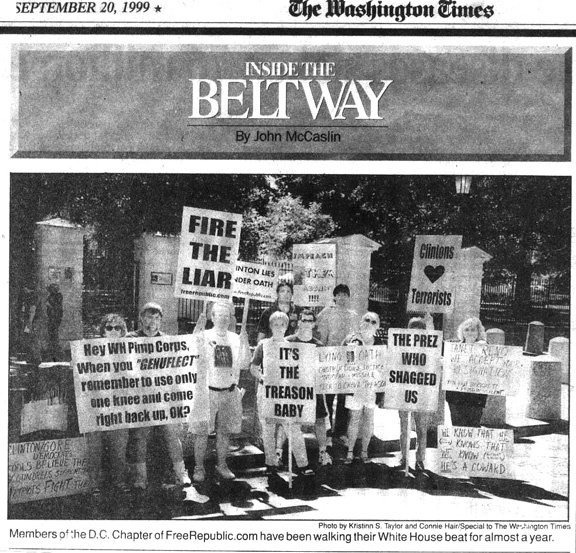 * 22 May 1999, Peace Action / DC Coalition to Stop NATO bombing - 12 noon at Dupont Circle, march to White House. * Saturday-Monday, May 1-3, 1999 - School of Americas actions in Lafayette Park and at the Pentagon (numerous people arrested). Also "Impeach Clinton" demonstrators on Saturday (they've been coming for months), stressing the China nuclear technology/spy transfers. * Sunday, April 25, 1999: 14th Street Bridge to be Picketed by anti-bombing demonstrators while NATO dignitaries head for the airport. * Saturday, April 24, 1999: Serbs protest the bombing in Lafayette Park at noon. * Friday, April 23, 1999: Thomas was Arrested holding the peace line in Lafayette Park while Albanians chanted "Bomb! NATO BOMB!" nearby in the park, and the Citizens Summit called for denuking NATO on the other side of the White House. NATO ministers in Washington, D.C., prompted an armed police camp during the 50th Anniversary Summit, April 23-25, 1999. Depleted Uranium Keeps On Killing and "Bill Clinton says: 'Solve differences with words, not guns' - Stop Bombing" were the messages on Thomas' confiscated signs. When Thomas retrieved the sign the next day, he added the message "Welcome to the Police State" and positioned it next to the fence for the cameras of tourists. Police did nothing but order the victim out of the park when a nonviolent "Stop Bombing" advocate dressed up as Uncle Sam was beaten by some of the Albanian demonstrators, many of whom were wrapped in American and Kosovan Liberation Army flags. "They're lucky the flag amendment hasn't passed," Thomas says. * Monday, March 8, 1999, 9 a.m. to 5:30 p.m.
Nuclear Y2K Symposium, Canon House Office Building, Caucus Room 345, Speakers: Dr. Helen Caldicott, Rep. Ed Markey, Sen. Tom Harkin, Bill Ulrich, David Lochbaum, Michio Kaku, Rock Cowles, Paul Gunter, Michael Murphy, Judith Johnsrud, Dan Plesch, Dr. Ted Taylor, Bruce Blair, Michael Kraig, Stephen Young, and others. * Congresswoman Lynn Woolsey's briefing on her nuclear weapons convention resolution, Monday, June 1, 1998, 441 Cannon HOB, 2:30 - 4 pm -- Dr. Ted Taylor spoke warmly about Proposition One/HR-827, as well as Congresswoman Lindsey's resolution. * The 17th annual Anniversary Picnic in the park, June 3, 1998. Hope you'll put this date on your calendar this and every year as "Peace Park Day"! * June 16, 1998, 5-6:30 p.m., Bishop Thomas Gumbleton, Detroit, spoke in Lafayette Park about nuclear weapons and human rights (and the vigil!). * June 24, 1998: Press Conference at the United Nations, follow-up on October 1997 Anti-Cassini rally in Lafayette Park, New York, -- Noflyby Action calls for reprogramming of Cassini plutonium probe, due to swing by Earth in June, 1999. E-mail Jonathan Haber or call Tina Bell (212-533-2125) for details. * Hondurans vigiled the last week of a month-long fast to stop deportations of Latin American immigrants. * Japanese peace delegation visited and shared concerns about U.S.-Japan Defense Guidelines -- Peace Constitution is threatened. October 12, 1997 -- Rally to "Break the Nuclear Chain"
6/23-6/26, 1997 - Pilgrimage for the Removal of Military Bases at Okinawa: JAPAN LAWYERS INTERNATIONAL SOLIDARITY ASSOCIATION. Press Conference, Lobbying, Meeting with Representative David Minge, and a Reception at Mott House, 122 Maryland Ave. N.E. on Thursday, June 26th at 6:00 p.m. to 8:00 p.m.
June 21, 1997, Peace Prayer Circle-Lafayette Park at Dawn, sponsored by Environmental Crisis Center, Linda Safley, Administrator. 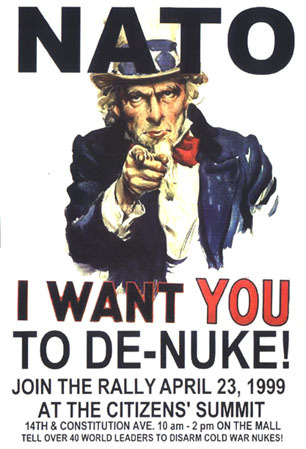 5/16/97 - A recent poll was introduced to Congress indicating 80% of the American public wants a world free of nuclear weapons. 5/06/97 - Friends of the Earth - Former U.S. Attorney General Ramsey Clark- Depleted Uranium Project promoting "Metal of Dishonor"